More and more furniture retailers are opening online shopping options because of the paradigm shift in Australia’s shopping habit. Furniture shopping is supposed to be about the feel of the wood on one’s fingers, the plush sense of a lounge on one’s bottom, experiencing the softness of a bed. But shopping is no longer as obstinate as that. There is a shift in the trend of every Australian’s shopping activity. According to the ABS latest stats; of Australia’s 15.4 million internet users, about 75 per cent shop online. These are the kind of statistics that prompt some retailers to allow online shopping for their products. Australian research company IBISWorld made a forecast that the online household furniture sales will grow about 20 per cent this year from last. That’s about $360.3 million which will continue to grow in the next five years. The shift in the online trend is generally because of convenience. Buying is just at the tip of one’s fingertips, which makes for a very quick buy. But it’s also practical because it doesn’t take a long time to shop and it’s easier to compare prices – by simply opening another browser rather than going to another store. IBISWorld also noted that furniture companies welcomed the online trend because they are saving on labour. Instead of spending on salaries of a large team of staff, furniture companies are now investing on labour-saving technology. Retailers may need to invest in reliable technology but that’s minimally a one-time expense. There will be fewer staff needed in the business, in both sales and operations. Everything will be available online—the descriptions, the prices, the marketing line. At any time of the day, a customer can message the business owner about the products sold online. Even if it’s just an online interaction, it will give a sense of personal communication between buyer and seller, which is important. There may be thousands of people passing by furniture stores every day, but a business is already in luck if about a hundred go in. The buying customer is just a percentage of that. But millions of Australians are online. Perhaps tens of thousands actually go through one’s website and a percentage of that actually buys. But a percentage from a hundred compared to a percentage from a thousand makes a huge difference. Selling online significantly multiplies the accessibility of your furniture to the masses and ultimately to your buying customer. There are a hundred different ways to improve online marketing without incurring huge expenses. 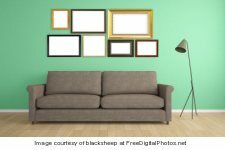 For front-of-house display, any online retailer will have a choice of which furniture will have prominence on the website. This can be done in the actual store, too. However, online merchandising is more easily done and is less laborious.